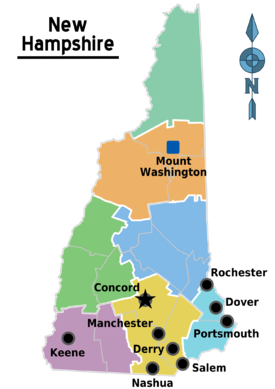 New Hampshire  is a state in New England in the north east of the United States of America. Noted for its independent inhabitants, New Hampshire has much natural beauty. Easily accessible from Boston, New Hampshire is a popular weekend destination. In addition to its many quaint towns, lakes and mountains, New Hampshire is home to some of the nations most exclusive prep schools and the Ivy League Dartmouth College. Splurge and stay in one of the historic grand hotels in the White Mountains or relax in a lakeside camp. Waterville Valley — a resort town in the White Mountains. Residents of the state are proud of the nature around them, so careless actions that damage the local environment are not appreciated. If hiking in the White Mountains, make certain that your travel plans are sound, as volunteer rescue teams do not appreciate being called in the middle of the night to find lost tourists. However, as tourism is the main industry in New Hampshire, tourists are certainly greatly appreciated. Manchester - Boston Regional Airport, Brown Av. Route 101 exit 2, Manchester, Phone: +1 603 624-6556, . A convenient way to get to the city and much of southern New Hampshire. Sometimes used as a low-cost, low hassle alternative to Logan International Airport in Boston. Vermont Transit, Toll free: +1 800-552-8737, . Service from Montréal, Vermont, and Maine. Concord Coach Lines, Toll free: +1 800-639-3317, . Service from Boston, Massachusetts and Maine. There is limited access to New Hampshire by train. The Downeaster only serves the seacoast region, passing through from Boston North Station to Portland, Maine. Note that if coming from south of Boston on the NE Corridor, trains terminate at Boston South Station, and you must connect via the T or taxi to North Station. Alternatively, buses (see above) leave directly from South Station. The Vermonter primarily serves eastern Vermont, but also serves Claremont, although several other stops are across the Connecticut river from New Hampshire, including Bellows Falls (across from Walpole) and White River Junction (across from Hanover and Lebanon). Concord Trailways and Dartmouth Coach offer service to much of the state, however the easiest way to get around is by car. Most areas are underserved by bus (and train) so there may be no other option. Manchester is a revitalized historical mill town. The White Mountains is a beautiful region with good hiking and skiing. Dartmouth College is an Ivy League school in Hanover with a beautiful campus. The Hopkins Center hosts an impressive number of highly regarded performers. Seats at the Hopkins Center can be obtained easily. Visit a small town outside of the "Golden Triangle" (Area from Salem to Nashua to Manchester) and check out the atmosphere. Mount Washington (6,288 feet) is the largest mountain in the Northeast, and the site of the highest recorded windspeed in the world (231 miles per hour). Mount Washington provides an excellent experience for a hiker, contains Tuckerman's Ravine, a popular and difficult skiing destination reached only on foot. Good terrain with great skiing. Attitash, Barlett, +1 603 374-2368, . The Balsams, Dixville Notch, +1 800-255-0600, E-mail: [email protected], . Bretton Woods Mountain Resort, in Bretton Woods is New Hampshire's largest. Dartmouth Skiway, Lyme, +1 603 795-2143, . King Pine, East Madison, +1 603 367-8896, E-mail: [email protected], . Cranmore Mountain, in North Conway. Mount Sunapee, Mount Sunapee, +1 603 763-2356, E-mail: [email protected], . Pats Peak, Henniker, +1 603 428-3245, E-mail: [email protected], . Ragged Mountain, Danbury, +1 603 768-3600, E-mail: [email protected], . Tenney Mountain, Plymouth, +1 603 536-4125, E-mail: [email protected], . Waterville Valley, Campton, +1 603 236-8311, . Whaleback, Lebanon, +1 603 448-1489, E-mail: [email protected], . The White Mountains are a common destination for hiking, located in the middle part of the state. Mt. Monadnock (3,165ft), a designated National Natural Landmark is said to be the 2nd most frequently climbed mountain after Japan's Mt. Fuji. Unlike many neighboring states, there is no sales tax. New Hampshire is known for its handcrafted goods. Each August, Newbury hosts the 9-day League of NH Craftsmen's Fair which is the nations oldest continuously running fair. New Hampshire is also known for its impressive selection of liquor. Liquor is "regulated" in the state and there are over 79 modern and sizable outlets run by the New Hampshire Liquor Commission. The largest location is a new 33,000 square-foot store in Nashua. Cigarettes are also by far the cheapest in the region. New Hampshire offers up many great roadside diners, places that are a belt busting quick cheap eateries. Strong points are pancakes with local maple syrup and beer from one of many of the local breweries. Portsmouth and Manchester have the best selection of restaurants. Dining in many rural areas is patchy but there are gems to be found. While much of the state is rural and not known for its nightlife, there are some clubs to check out in Manchester and buzzing Portsmouth has many restaurants and bars to choose from. Under-age drinking is highly enforced (including small towns) with very stiff penalties. There are several breweries and brewpubs worth a visit in New Hampshire. The Portsmouth Brewery in, you guessed it, Portsmouth. Budweiser, Merrimack. A Budweiser brewery in Merrimack which you can tour. 603-595-1202. New Hampshire is constantly ranked among the safest states in the country. Crime is typically not a problem, but make sure to be careful while driving—especially if you're unfamiliar with winter driving. Moose occasionally wander onto the roads in the White Mountains region and Northward and are a serious hazard. When hiking, bear encounters are possible and the weather can change rapidly at higher elevations, especially in the Presidential Range. In New Hampshire no license is required to own a firearm, and the state is home to a large population of firearm owning adults. Do not be alarmed if you see an individual carrying a handgun or rifle, as this is perfectly legal and protected under the Second Amendment of the United States as well as the New Hampshire Constitution. While a large percentage of New Hampshire's population owns firearms, gun-related crime is incredibly rare in New Hampshire, and New Hampshire is frequently ranked among the safest states to live in. Maine - The state's northeastern neighbor is known for its seacoast fishing villages, wooded and remote interior, and stunning vistas such as that found in Acadia National Park. Massachusetts - The birthplace of America's revolution, New Hampshire's southern neighbor is home to historical towns, the vacation hotspot of Cape Cod, and the always-interesting city of Boston. Vermont - The fall foliage in New Hampshire's western neighbor is a site not-to-be missed, while during the rest of the year the state offers a rural charm unique in America. Quebec - New Hampshire's northern neighbor, Québec's European feel, history, culture and warmth have made it a favourite tourist destination both nationally and internationally. This page was last edited on 10 December 2018, at 00:08.